We recently printed custom signs for our friends at the House Of Blues Cleveland. Since they’re right here in Cleveland, there was really no reason to ship the job. Ali Sedivy from HOB had planned on stopping by Jakprints to pick it up when it was done. But before that could happen, Customer Service Rep Matt Murphy took a look outside, saw the sun shining and strapped the signs on his back. Then, he and Sales Manager Dan Byler hopped on two bikes from the Jakprints Staff Bike Fleet and headed across town. The two rode past cars stuck in traffic and cruised through the streets of downtown Cleveland until arriving at the restaurant and music venue on East 4th Street. They then installed the custom signs to make sure they were a perfect fit. While bike delivery isn’t something we normally offer, we can ship to just about anywhere you’d like. Below are photos from their journey. One more thing, before you start, open this up in a second tab to listen to while scrolling: Soundtrack. Matt’s got a great idea. Justin Markert is the New Media Coordinator at Jakprints. He handles all of the Social Media, SEO and Analytics, a hefty portion of copy writing, and is currently trying to write this blog post in the third person without it being awkward. Movie: Where to start!? Some of my favorite writers and/or directors: Aaron Sorkin, Charlie Kaufman, Wes Anderson, Michael Mann, Mark Duplass, Tarrantino, Michel Gondrey, Christopher Nolan, Craig Brewer, PT Anderson, too many to name!!! Band/Musician: Right now: Bon Iver, Elliott Smith, Jeff Buckley, Kanye West, Talib Kweli, Pearl Jam, David Bazan, Guided by Voices, Rival Schools, Herzog, Refused, Dirty Projectors, The Modern Electric, Joseph Arthur, Dead Prez and I’m sure others that I’ll remember later and wish I would have listed. For this month’s Employee Spotlight, we spoke to VP of Product Development Bill Rupnik. Bill is one of Jakprints most seasoned employees, he’s been with the company for 11 years! When he’s not at Jakprints developing new products, you can find him at the William Rupnik Gallery, an art gallery that he owns and operates in downtown Cleveland. Let’s take a closer look at the man that is Bill Rupnik. This weekend is the HOW Live Graphic Design Conference, and if you’re not in the know, it’s a big deal. It’s actually four different conferences combined into one mega event. This year the conference is calling Boston it’s home. We’ll be there again this year, and per usual, we’re not going empty handed. Since we know the best of the best will be there, we stepped up our game and put together a design piece that we are quite proud of. 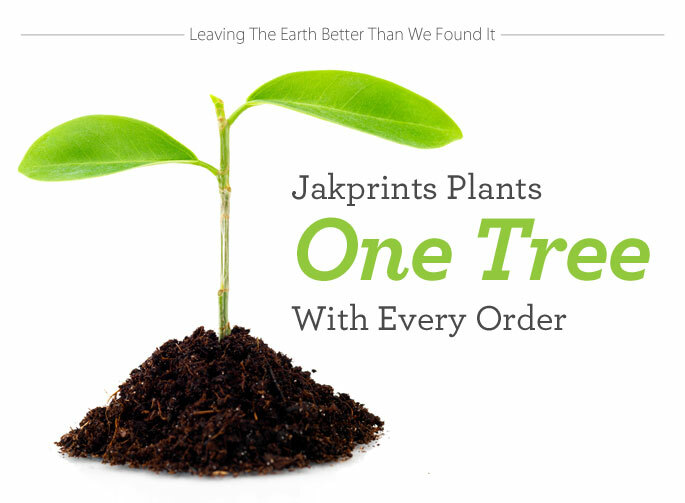 We were excited about Earth Day and to celebrate here at Jakprints, we’ve officially unveiled our tree planting campaign. Since January, we’ve pledged to plant a tree for every order processed. That’s right, every order placed for apparel, stickers, full color printing and large format printing will have a tree planted. Be sure to check out our redesigned Green Printing site, we’re pretty proud of what we’ve been able to accomplish. This is just the next step in our attempt to leave the planet better than we found it. We’ve always been mindful of the planet. Being green isn’t just a marketing angle for us, it’s an integral ingredient of the Jakprints culture. Even in everyday life at our 130,000 square foot facility, environmental responsibility is practiced everywhere. In addition to vegetable-based offset inks and responsibly forested paper, all excess paper is recycled, there are compost bins in the kitchen and many of our staff ride their bikes to work. Since 2007, we’ve saved more than 29,000 trees; 5,700 cubic yards of landfill space; 11.9 milliongallons of water; 7.1 million kilowatt hours of electricity; 621,000 gallons of fuel; and 102,000 pounds of pollution. Position: I’m the Sales Manager. Since we don’t have an official outside sales staff I’m actually the first guy to delve into that role as well. Color: Black, dark grey, sometimes white and red. Food: Anything fresh. I’m not a very picky eater but I prefer the good stuff whenever possible. Movie: For some reason I’m partial to movies that are shot or set outside of the United States, like The Lives of Others. I also enjoy horror movies in the theater. Insidious was a blast. I also saw Tron Legacy in 3D twice in the theater. I regret not seeing it a third time. My favorite skate video is a film by Pontus Alv called The Strongest of the Strange, which happens to be the title of a poem by Charles Bukowski. The soundtrack is really great. Band/Musician: Man, I listen to so much different stuff it’s hard to say. Lately I keep coming back to stuff like Neutral Milk Hotel, Howlin Wolf, Wooden Shjips, Frank Fairfield, Smog, and Carsick Cars. I always enjoy High On Fire live too. Book/Author: I usually am reading motorcycle repair manuals or motorcycle and skate magazines; but for real authors I like the works of Twain, Bukowski, Vonnegut and Hemmingway. I get into other random stuff like this book on Shape Shifters that a coworker lent me. Currently I’m in the middle of reading a book by Yvon Chouinard, the founder and owner of Patagonia. It’s a pretty good read and he seems like an interesting guy so far.